Though I launched Londons Times Cartoons in 1997, most of the first two years of it was practice or trial and error. It was also mostly in black and white, though, by the end of 1998, we had a few hundred color black and white ones under our belt. Even though Gary Larson had, with his “Far Side” paved the way, was the trailblazer “off all things absurd” in cartooning, for many of us, we were still taking baby steps regarding subject matter and “just how absurd we could actually be. After all, many of us, though all black sheep of families, lived in town where our “normal” family members lived, and was sure to tread carefully so as not to embarrass them. As word had gotten back to me from mutual friends I’d embarrassed them from the start, all I could think was, “What the hell. Go for broke. Who cares what they think anyway. They probably don’t *get* them anyway. I tested that theory once and gave one of my married relatives a Seinfeld parody cartoon including Kramer with both of them in divorce court. It was a play on the words “Kramer Vs Kramer” being “the ugliest divorce imaginable. I was quite proud of the cartoon. The last thing on my mind was “how my kinfolk’s marriage was doing. I had the cartoon framed and gave it to them for a holiday or birthday, I forget which one now. Word got back to me they were “livid”. And “how dare me play with something so sensitive as their marriage”. Well that was the first I’d known that “things were shaky on that side of the family, but I had to shake my head, just because they didn’t get that it was a “play on words” and had nothing to do with their marriage. I thought it was a most thoughtful and creative gift. They didn’t agree. I learned at that moment, “You cannot please everybody”. So the year 1999 came around and everyone’s mind was on Prince’s ability to party and the following New Years when every computer in the world would break. Not too many were thinking of my cartoons and their themes. And since they weren’t looking that closely, I decided to try some “Larsonesque” ideas, such as bringing fish and other animals to life and putting them in settings they might not otherwise be; such as sharks in a nightclub…..playing folk music. I held my breath and asked Rich (our manager at the time) to upload it and waited for feedback. There was no Google yet (though word was out that this really neat search engine called “Google” was about to launch and it did that same year. Of course there was no Twitter or any social media for that matter. Hence there was no instant gratification. I had to send the cartoon out in emails (that I had captured on my website from writing a newsletter). I also sent this one and about 10 others out to “name-brand” celebrities and asked for feedback; reviews of sorts that I could upload to my site. Oddly enough, several celebs wrote back. There was not one bad review and all allowed me to include them on my site. Some of them I still display. I grew up not far from the Gulf Of Mexico (or “The Gulf” as we called it in south Mississippi). We spent a lot of time swimming, skiing and fishing so we certainly saw our share of sharks. Luckily, the merely swam with us and none of us were ever attacked (though we would occasionally read or see on the news of such attacks). Another common love that I had with my friends was the love of music. Folk and protest songs were some of our favorites; Dylan, Joan Baez, Joni Mitchell, Pete Seeger, Peter Paul and Mary and you name it, we loved them. Suddenly (again thanks to Gary Larson), I realized it was okay to combine some of the most unexpected things and turn them into cartoons. 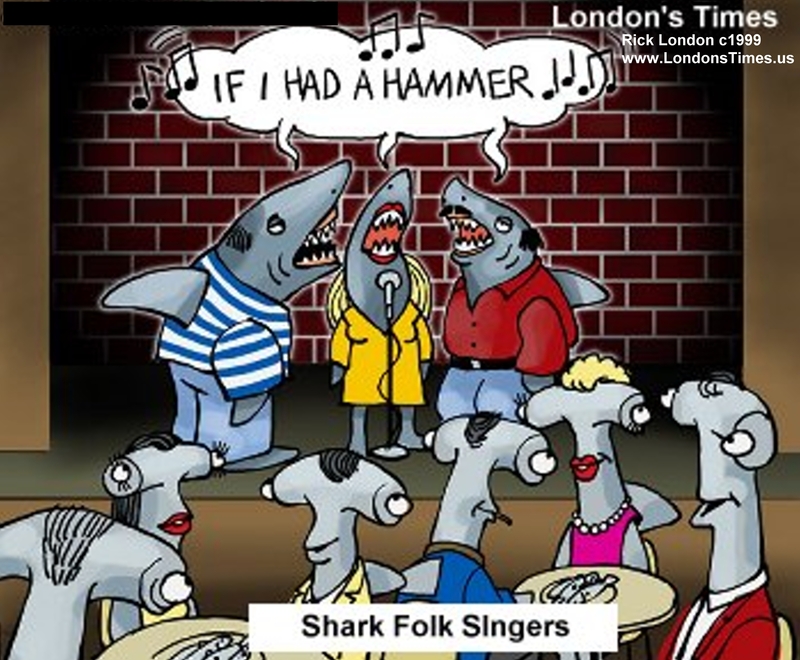 This is but one of them; “Shark Folk Singers” or “If I Had A Hammerhead” by Londons Times Offbeat Cartoons. I hope you enjoy it. Though we’ve been selling them for about 16 years, they continue to be one of the most popular of all our images.